The Daytona Beach Pier is the most recognizable landmark on Daytona Beach and has been the center of beach life since the beginning of the community. The original pier, constructed of palm logs, was built before the turn of the 20th century and extended 600 feet into the ocean. It was built by Thomas Keating and was known as the Keating Pier. It was located at the end of Main Street, where the present pier is located. On January 20, 1920 a tremendous fire destroyed the pavilion and most of the pier. In 1924, Keating sold the remains of the pier to Jeter McMillan who tore it down and began construction of a new pier. The new Pier Casino opened on June 11, 1925. The pier was 1,000 feet in length and featured a Victorian style building. Its ornate ballroom could accommodate 2,000 dancers and hosted some of the top bands of the day. In addition to dances, the Pier Casino was the scene of charity balls, weddings, beauty contest, social events as well as civic meetings. 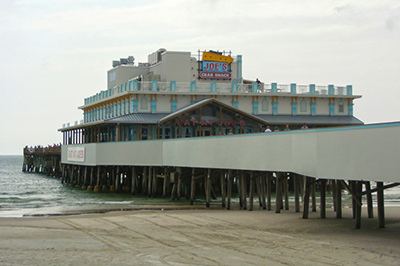 The pier has changed ownership several times since McMillan died in 1946. In 2004, it was acquired by the city of Daytona Beach who then leased it to a corporate operator. In 2009, the city took operational control of the pier, completely refurbished it and sought a long-term, quality tenant for the casino building. Over the years, the pier has withstood the constant pounding of the Atlantic surf, fire and hurricanes, but it still stands, just as it was built in 1925. It has been known as the Ocean Pier, Keating Pier, Pier Casino, Main Street Pier and now the Daytona Beach Pier, but to most people it is simply known as “the pier” - the most recognizable landmark on Daytona Beach and source of many Daytona memories. There are several parking options in the vicinity of the Daytona Beach Pier. Pier visitors can park in the metered parking lot at Breaker’s Oceanfront Park, which is at the base of the pier (on the corner of Main Street and Ocean Avenue). The cost is $1.25 per hour and there are two, automated payment stations which accept cash and credit cards. There is a valet parking option at Breaker’s Oceanfront Park. The cost is $10 for the entire day. There is a large, privately-owned parking lot, just north of the Daytona Beach Pier on Ocean Avenue and Atlantic Avenue. The cost is $10 for the entire day. Peabody Auditorium’s parking lot on Wild Olive near Main Street. The cost is $1.25 per hour and there is an automated payment station which accepts cash and credit cards.